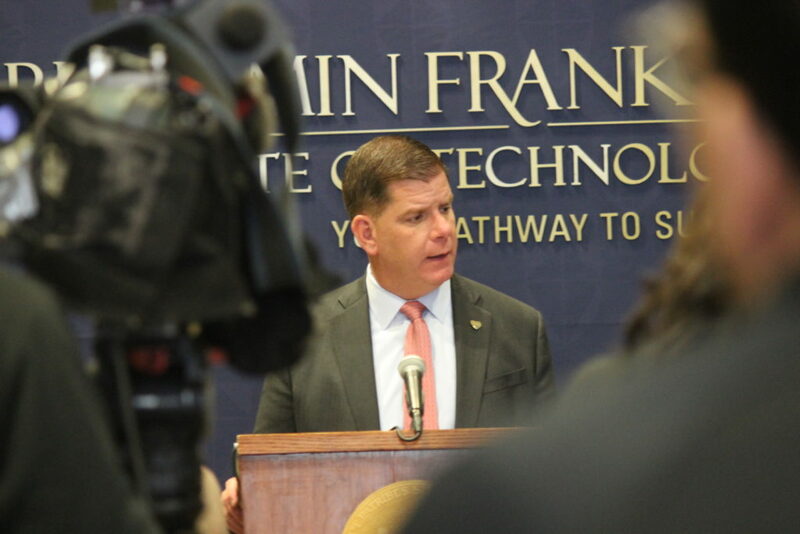 Benjamin Franklin Institute of Technology (BFIT) has become the fourth college to join the Tuition-Free Community College Plan and the first private school to do so, Mayor Martin J. Walsh announced on Wednesday. Mayor Walsh addresses a crowd gathered in the lobby of Benjamin Franklin Institute of Technology. Mayor Walsh was joined by BFIT President Anthony Benoit, as well as Boston Public Schools staff and students, in sharing their excitement for the program’s expansion. Artis Street, a teacher and instructional coach at Jeremiah Burke High School, noted that this can be a bittersweet time of year – a time when students receive their college acceptance letters and then take a hard look at the bill. “College in Boston is very expensive and my parents couldn’t afford [it],” she said. Mayor Walsh’s 2019 legislative agenda includes support for a state bill that would waive tuition and mandatory fees at community colleges for certain low- and moderate-income students. “We want to see this program that got started here in Boston go state-wide,” Mayor Walsh said. Over 300 Boston students are currently enrolled in the Tuition-Free Community College Plan. Read the City of Boston press release to learn more.